Please Note: This product is not purchasable online. Please contact customer service to inquire about ordering procedures. SOLD OUT!! CHECK BACK SOON! Thanks. 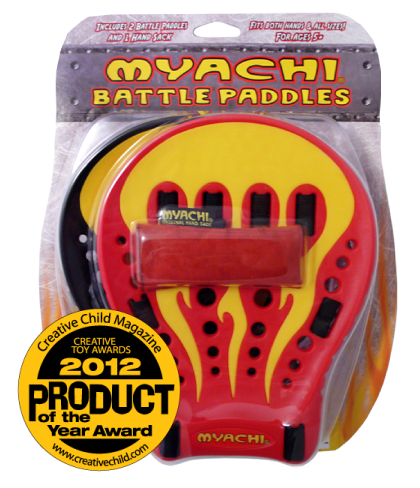 Contains 2 Paddles + 1 Myachi! Inspired by the design of a lacrosse stick head combined with the functionality of a baseball glove, Battle Paddles allow you to catch a hand sack thrown from much greater distances and heights as well as successfully perform more difficult tricks! Now, players can compete harder, faster, and longer! Compete at any of the numerous games developed to play with a Myachi Hand Sack and Battle Paddles: Myachi Pong, Myachi Football, Myachi Lax, Myachi Golf, and many others.